"I am I" is the new band fronted by former Dragonforce singer ZP Theart. With Dragonforce having just released their new album, it's now time for I am I to do the same. 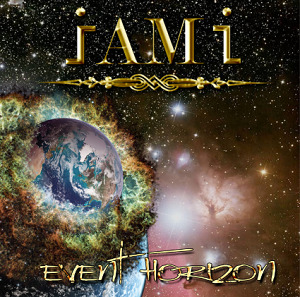 Event Horizon' will be the first heavy metal album to be released on USB packaged in a CD style case with full artwork, and can be bought from the Official I AM I website at http://www.iamiofficial.com That is certainly an unusual gimmick, but in my view it could hurt sales unless it also includes a CD - by doing it as a USB memory stick they are forcing people to listen via their computer whereas many people still prefer CD's (even if they import it onto the computer, the CD itself can be listened to in the car etc). Yes most of their fans will be happy with the format, but it does seem short sighted to alienate even a small percentage of their fans when every sale counts these days. So what's the music like? Well the good news is that unlike Dragonforce this isnt a case of playing guitars stupidly fast just to prove that you can play that fast. Instead its a more sensible pace which I think suits ZP Theart's voice a lot better and there's still enough pace for plenty of great guitar work. The music is more hard rock/heavy metal than anything else. Album opener "This is my life" clocks in at almost six minutes and is fairly fast paced which allows the guitars to shine in places and still give the vocals plenty of attention. "Silent Genocide" is the track that has been released already so fans will already know this song. "King in ruins" is a ballad and although it starts with just a piano the guitars soon join in to give it plenty of power while still keeping that slow ballad feel. The vocals are certainly the star here with ZP Theart putting in a great performance. This is a great album, and is certainly going to get the band a lot of well deserved attention. With them playing Bloodstock later this year then assuming they are as good live as they are on the album then they will almost certainly come away from there with a whole load of new fans. A great album thats well worth buying. "Event Horizon" will be released on 26th May.